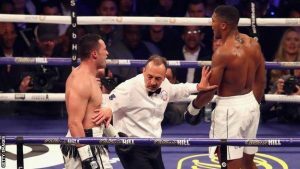 Anthony Joshua beats Joseph Parker on points to add WBO world heavyweight title – Royal Times of Nigeria. 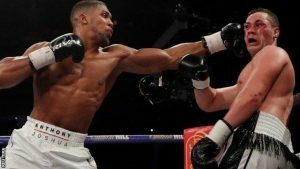 Anthony Joshua unified the WBA, IBF and WBO world heavyweight titles with a controlled performance in a unanimous points win over Joseph Parker at a tense Principality Stadium in Cardiff. The Briton, 28, used his left hand to telling effect throughout an intriguing affair, in which New Zealand’s Parker displayed swift hands, movement and impressive durability. But his WBO title always looked like it would end up round Joshua’s waist as a significant points gap opened up, with the favourite landing a hard left uppercut in round eight and two stinging left hooks early in the 10th. Parker tagged his rival to howls of concern in the 11th and he deserves immense respect for becoming the first man to take Joshua to the scorecards, which read 118-110 118-110 119-109. 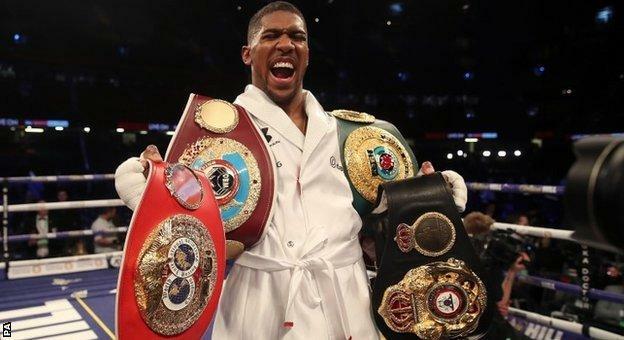 Joshua raised his right hand on ring announcer Michael Buffer’s reading of the cards and he now holds three of the four recognised world titles. Parker looked to the sky. But the 26-year-old New Zealander played his part in a compelling evening and brought colour to an intriguing build-up. Never before had two world champions from the glamour division met to unify titles on British soil. 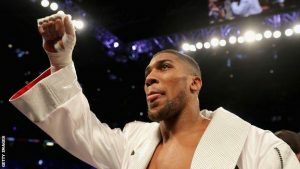 For the away fighter this was a whole new level of scrutiny; for Joshua, it was a third consecutive stadium fight, with a cumulative 250,000 seats sold in the process. Each fighter walked to the ring to an accompaniment of strobe lights, flames and fireworks, with the estimated 78,000 in attendance providing a glittering background as smart phones lit up the tiers. When the bell rang, Parker looked sharp, flicking his left jab to keep his opponent at bay and maintaining a guard with just his right hand, compared with two high hands from Joshua. Afterwards, Joshua pointed to a bout he felt came down to “boxing finesse” and there is no doubt he used the jab and repeated left hooks tactically to stave off his opponent’s threat. It took until the halfway stage before either man truly began to load their shots, as early respect gave way. Parker, stung early in the sixth, gave chase and landed his own left hand from a crouched position. The beaten man admitted he lost to a “better champion” but he at least showed the “granite chin” his camp had built much of their hope on beforehand. Unlike Joshua, Parker has never been dropped as an amateur or a professional and he showed his durability in sucking up two hard left hooks early in the 10th. This was a more chess-like Joshua. The knockout artist Britain has grown to love was forced to show us poise over 36 minutes, although the result never really looked in doubt.